From snowy Minnesota comes one of the most effective personal defense loads of all time -- the Hydra-Shok! This 10mm cartridge by Federal features a 180 grain jacketed hollow point projectile that loses virtually none of its destructive potential after passing through thick fabric thanks to its unique center post design -- that little column in the center of the bullet’s nose cavity does its job well. This bullet’s jacket sports notches around its tip which serve to preprogram expansion by providing fault lines along which it can peel back during penetration. 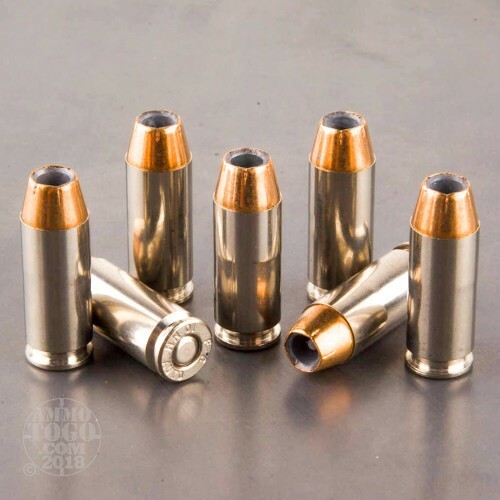 The Hydra-Shok’s tendency to mushroom reliably not only creates a wide wound channel, but further greatly reduces the chances of overpenetration that could jeopardize bystander safety. The Hydra-Shok’s bullet’s base is also protected by its jacket, so firing it won’t create toxic fumes which would detract from a target shooting session. (Training with your personal defense loads before using them in the field is very advisable.) This round’s new brass casing, sensitive primer, and consistent propellant are all indicative of Federal’s commitments to innovation and quality, so you can chamber it with confidence! 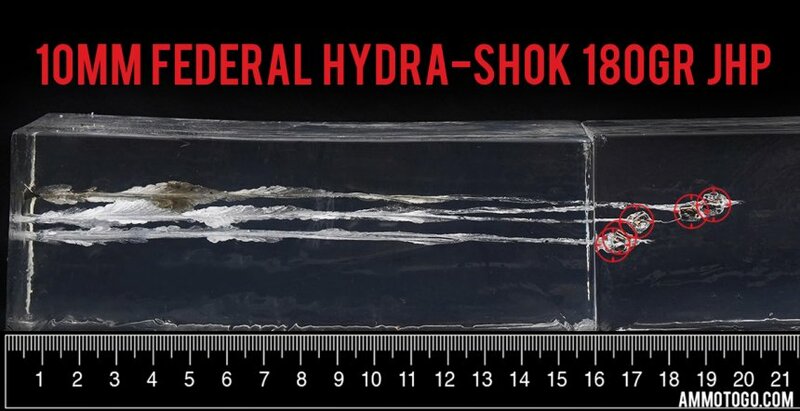 Using a Glock 29 pistol, we fired 5 different rounds of this Federal Hydra-Shok 10mm ammo into ballistic gel. Using a 4-layer barrier, we wanted to see if the bullet would get plugged prior to entering the synthetic gelatin we used for testing. Check out the results below to see how this ammunition stacks up to other 10mm loads we tested. 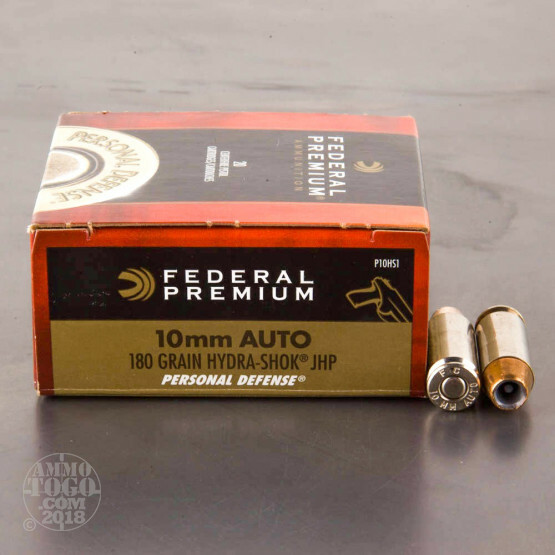 How do the results for this Federal Ammunition 10mm Auto compare to other 10mm? 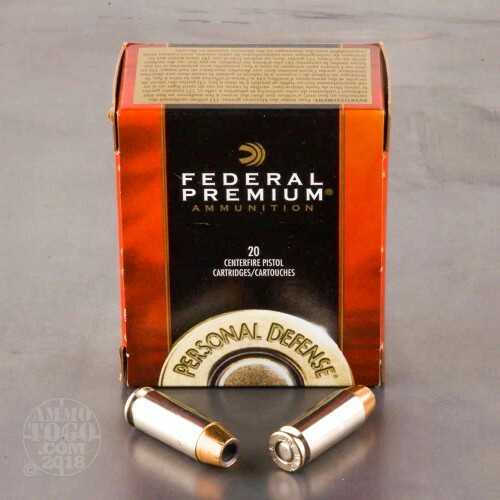 Expansion Diameter Compared to All 10mm Auto Ammo Tested MIN 0.4" MEDIAN 0.63" THIS AMMO 0.58" U.S. dime MAX 0.81"
Penetration Depth Compared to 10mm Auto Tested 0" 10" 20" 30" MIN 11.7" MEDIAN 18.6" THIS AMMO 17.7" MAX 48"